It was very exciting – and a little intimidating – to be invited to spend a day at an inner-city high school in Los Angeles. 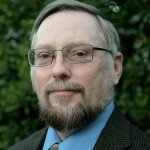 I have spent over a decade developing and promoting an interdisciplinary approach to teaching core concepts in science and mathematics; throwing out the traditional text and replacing it with science fiction literature instead. Clinical studies have shown that the science through literature program succeeds with ESL and ‘at-risk’ students – would it work as effectively in an inner-city school where many students read far below grade level, and the majority of the student body are ESL students? My goals for the day were relatively straightforward. To demonstrate that an interdisciplinary lesson engages everyone in the classroom in active learning across multiple core areas. 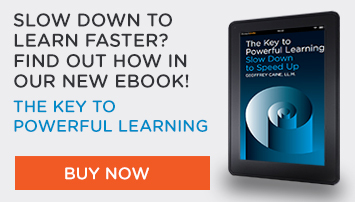 To help the teachers and administrators prepare to meet the challenges of the Common Core Curriculum that will be phased in over the next few school years. The first challenge was to prepare a lesson for the students. I worked closely with the classroom teacher, Mrs. Cathy Seabourne, to choose a lesson. Mrs. Seabourne noted that many of the students had seen news or video of the Chelyabinsk Meteor that exploded over Russia last month, so we decided to make a lesson about meteors, meteorites, and impactors – objects large enough to strike a planet’s surface and leave a noticeable crater behind. 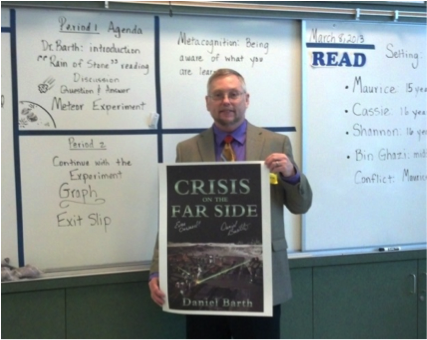 My new book, Crisis on the Far Side, had a plot twist that involved Maurice and his friends caught out in a deadly meteorite shower on the lunar surface, so we worked together to select an excerpt that would work as a 2000 word short story that the class could read together. Mrs. Seabourne chose an excerpt entitled: Rain of Stone; it introduced the idea that there are no ‘falling stars’ in the airless lunar skies. Instead, small bits of stone, iron, and ice strike the surface moving faster that rifle bullets. The story also introduces the idea of the impactor, an object which strikes forcefully enough to make a crater on the surface. As the science partner, I chose an activity called Impactor Adventure!, which allows students to actually make and measure impact craters on their desktops. I am also an advocate of Low-cost Science, an experiment that can be done for pennies using castoff materials is far more likely to happen than an experiment that requires computers or special equipment! The Impactor Adventure! Lab costs just pennies and requires only materials commonly found around the house. The Impactor Adventure activity also studies impactors, craters, ejecta, rays and other impact features commonly seen on the lunar surface. The Impactor Adventure! Activity can also easily be scaled up for students of physics and advanced mathematics studying kinetic and potential energy, crater volume, and other features. Mrs. Seabourne’s classes begin the day with 2-hour block schedule periods, this was a natural fit for our lesson. After a brief introduction, we passed out copies of the short story and began a shared reading. Mrs. Seabourne and I began reading, but we quickly handed off to students around the classroom. The students read very well; most needed to be helped over words like meteorite the first time they encountered them, but they mastered them quickly in the context of the story. Mrs. Seabourne did, on one or two occasions, stop the reading to “unpack what the author is telling us”. One scene has Cassie discovering a puncture in Shannon’s pressure suit, and saving her friend from certain death by stopping the air leak in time. Mrs. Seabourne elicits responses from the class. Why are they wearing space suits? Why is a rip in a pressure suit a life-and-death matter? By working with her reading students to understand the setting of the story, she is also teaching the science standards in a literary context that the students understand and relate to. “On the Moon!” said one student. “There’s no air on the Moon!” said another. “Why not!? Why isn’t there air up there?” someone challenged. The call and response of a smoothly functioning classroom continues for some minutes as the class as a whole reminds itself about the Moon as a dusty, rocky, airless environment with a black and starry sky; a place where people must wear pressure suits and shelter from radiation and meteoroid strikes. Mrs. Seabourne is teaching about literature and reading skills – and the children are learning science! They discuss setting and character and plot, but they speak of atmosphere and vacuum, and the difference between meteoroids, meteors, and meteorites. The Moon is their playground. The second half of the class was dedicated to the lab activity. The students were excited because they were participating in the science activity, not just watching or talking about it. We brought out aluminum pie pans and filled them with flour (about 4 cups per pan) and made a level surface by drawing a ruler across the pan. A 100 gram weight was then dropped into the flour (a round stone the size of a walnut will do) creating a crater. The students then measured the size of the crater (width and depth) and the height from which the weight was dropped. The students also measured the size of the ejecta blanket, the material blasted out of the crater by the force of the impact. Crater size (volume) and the area covered by the ejecta are both good measures of the impact energy. The students were able to see that the height from which the impactor was dropped related directly to crater size and ejecta area. Mrs. Seabourne’s students were able to perceive the relationship and we drew a rough graph on the board relating drop height to crater size. The experience had more profound impact than that. In conversations around the room, the students were using new vocabulary such as crater, meteor, impactor, and ejecta, more often. The story that was read gave a human context to the science experiment, and the experiment brought a tangible sense of reality to the story. New science concepts in the story are brought to life and integrated into the students daily experiences and each mode of learning reinforces the other. It was easy to see that the classroom was surging with life and enthusiasm; every student was engaged. Instead of seeing students sitting with arms crossed saying “I’m not gonna do that!”, I heard cries of “Gimme that!”, or, “I wanna make a crater now!”, and “It’s my turn!” By integrating science and literature, Mrs. Seabourne’s class had effortlessly stepped up to Common Core standards. In the last half of the day, Southeast High School reverts from block scheduling (2-hour periods) to standard scheduling (1-hour periods). So for the last half of the day, the science experiment converted from an individual activity to an interactive demonstration. 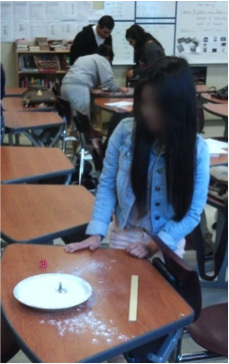 Several students were chosen at random to perform the experiment and then measure and report the results to the class. As a methodology, it would be preferable to stretch such a lesson across two days, alternating reading and science activities, but this approach worked well with the larger class sizes and time constraints we had to deal with. The last period of the day was one of the best because we had the AP physics class join us. The science through literature approach now showed its flexibility and scope! The AP students enjoyed the reading, but really seemed to perk up when the impactor experiment was performed. While the experiment was being performed by volunteers from the reading class, the AP group took a moment to analyze the experiment from a kinetic and potential energy standpoint. They were quick to pick up on the idea of gravitational potential energy stored in the impact mass as we lifted it above the table, but the idea that the excavated crater volume or the ejecta-covered region could be measured to determine work done on the surface was a revelation. The discussion quickly became mathematical and ranged over geometry, trigonometry and even touched on calculus as we discussed measurements and useful approximations made to make the mathematics more tractable. The real-world richness of this seemingly simple problem intrigued and fascinated the physics students! The end-of-day debriefing session was also interesting. Mrs. Seabourne noted that the children’s behavior had been exceptionally good throughout the day. She speculated that the novelty of the day’s activities had something to do with it, but she remarked that the active engagement of all the students was also a contributing factor. “My students aren’t shy,” Mrs. Seabourne remarked; “if they hadn’t liked your book, or they thought the science lesson wasn’t worthwhile, you would have heard about it!” Mrs. Seabourne commented that if these students didn’t like a book, it would quickly be vandalized or even disappear altogether. “The fact that they were engaged for the entire time without misbehavior or disruption says a great deal!” Mrs. Seabourne noted, pointing out that many of her students had trouble concentrating and found it difficult to stay focused on a single activity for more than 20 minutes at a time. A brief conversation with AP Physics instructor, Mr. Ancale was also revealing. 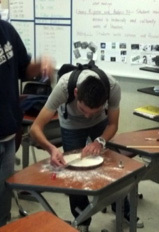 His students were very inspired by the hands-on approach that my classes take with AP Physics. Many of the AP students were intrigued by the science through literature concept, and interested in the lab activities. Mr. Ancale noted that the activities I had used provided a lot of scope for student creativity – much more so than typical ‘cook book’ lab activities that he had used for class before. Mr. Ancale also noted that student reaction to a more open-ended lab activity was enthusiastic, to say the least. At the end of the day, both Mrs. Seabourne and Mr. Ancale were very positive about the integrated and interdisciplinary approach to teaching science through literature. They had seen that the interdisciplinary approach described in Common Core standards and in the Maurice Series science activities had the power to engage students across a wide range of academic levels. They had also seen that the strength of this approach was its ability to meet students at their own level academically without short-changing their skill level or racing hopelessly ahead of them. It was a day or two after my visit that I received an email from Mrs. Seabourne telling me that ‘the kids are still talking about your visit!” and that many of the students wanted to know when I would be coming back. Like Professor Harold Hill in The Music Man, ‘I pass this way but once!’, but Common Core standards and teaching science through literature are here to stay. Read our interview featuring Mrs. Cathy Seabourne and her students’ interactions with The Maurice Series prior to Dr. Barth’s visit!